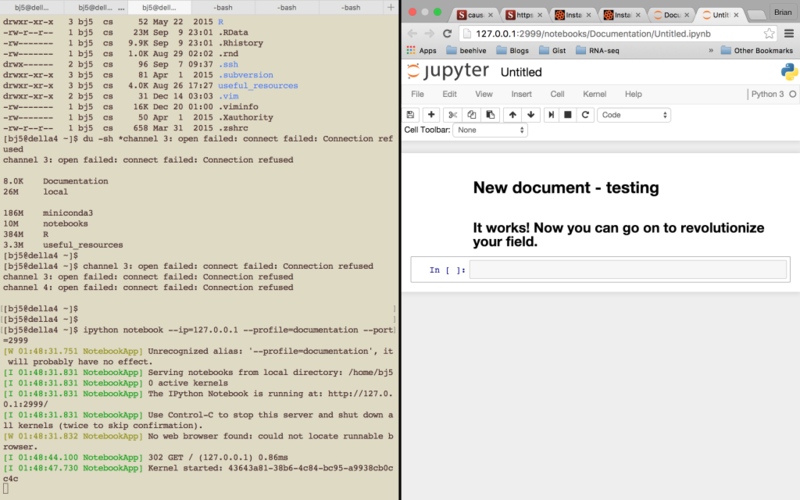 Thanks to Ian’s previous post, I was able to set up IPython notebook on Della, and I’ve been working extensively with it. However, when I was trying to sync the notebooks between the copies on my local machine and Della, I found out that the version of IPython on Della is the old 2.3 version, and that IPython is not backward compatible. So any IPython notebook that I create and work on in my local directory will simply not work in Della, which is quite annoying. Also, I think there is a lot of benefit to setting up and using Anaconda in my Della directory. It sets up a lot of packages (including Python 3, instead of the archaic 2.6 that Della runs; you have to module load python as Ian does in his post in order to load 2.7) and manages them seamlessly, without having to worry about what package is in what directory. Conda is an open source package management system and environment management system for installing multiple versions of software packages and their dependencies and switching easily between them. It works on Linux, OS X and Windows, and was created for Python programs but can package and distribute any software. conda will integrate these packages into your environment. Neat.